News hit last week that the Marvel Universe is coming to an end in May. As someone who has been reading comics for almost twenty years now, I took the news in my stride: the way I see it, universes on both sides of the fence have undergone minute revamps, as well as massive overhauls, since I became invested in their characters. I have no ownership of them; I’m merely along for the ride. If the powers-that-be choose to reinvent their respective wheels, go for it. I’ll try out the comics when they come out, and if I don’t like them I’ll step away. Such is life. Until then, I’ve got a bunch of unread collections to get through. And as the MU as we know it will soon cease to exist, it seemed fitting to reminisce on times-gone-by with AVENGERS PRIME by Brian Michael Bendis and Alan Davis; a limited five-series that focuses on the ‘core trio’ of Avengers: Iron Man, Captain America, and Thor. 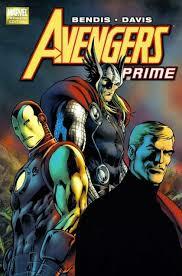 Chronologically speaking, AVENGERS PRIME takes place after “Dark Reign,” and was the series that welcomed in the “Heroic Age.” What this means, basically, for the uninitiated, is that Norman Osborn’s (aka The Green Goblin) stint as the Director of SHIELD has come to an end with the fall of Asgard, and the Avengers as dysfunctional as ever; their mistrust has increased and fermented ever since the Civil War. AVENGERS PRIME begins right after “Dark Reign’s” final battle, when Cap, Thor and Iron are teleported to mystery mystical, and hostile, land. Separated, the three endure personal challenges, eventually regrouping in a tremendous culminating battle. As always, Bendis’s dialogue is apropos, and in this instance he completely annuls his perpetual use of captions, allowing Davis’s timeless art the room it needs to shine. The story is a little one-note; little in the way of revelations or gasp-worthy twists. 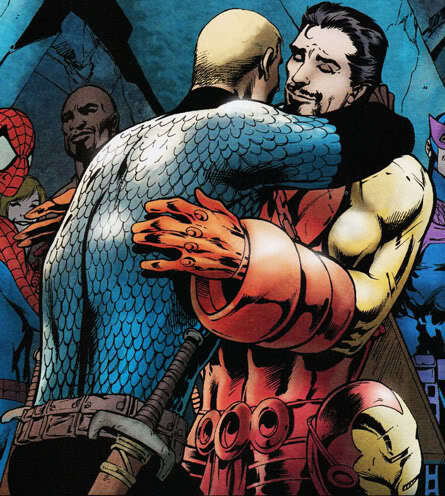 But it’s a fun story that underlines the differences between the team’s key members, and also the ties that bind them. It’s about friendship, and all too often nowadays that gets forgotten, with a greater focus on larger-scale threats and universe-ending apocalypses. It’ll be interesting to see what kind of relationship is forged between the trio in the forthcoming Marvel Universe.